Is located in a village farmhouse in Halmeag. The main house was built in 1878. In earlier times it was customary for a Romanian family to erect an additional house, if a son or daughter was to marry. For this reason two houses were built on our farm and connected on the front, sometime during the 19th century. The buildings were neglected and decrepit when we purchased the farm. There was no electricity, no plumbing or bathing facilities. We renovated everything from bottom up and upkeep is a returning job. Between the two houses there is a patio where you can relax in the shade of the vineleaves after a long day of horseback riding. In one of the houses we only have bed- and bathrooms. Here you will not be disturbed by the activities in the other buildings. In the house vis-à-vis there is a lounge with a bar. Next to it we have a cosy dining room with an antique cast-iron stove which we heat on cold days. This farm house had been extended over the years by a successive row of rooms. 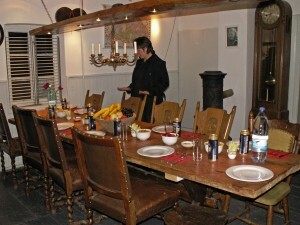 Today we have here the kitchen, another guest room with en suite bathroom, the stables for our stallions and more barns. Across the street we renovated another farmhouse for our guests. Here is a studio with a kitchenette and bathroom and seperately upstairs two guest-rooms and a bathroom. In total we have six double rooms and five bathrooms with adequate space. 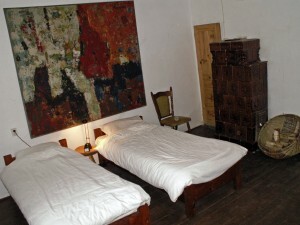 All rooms are furnished differentely, some with antique furniture. All the beds are new. Some guest rooms have a private bathroom and other rooms share facilities..
You will be living in a farmhouse and you are welcomed to take part in our everyday life. The atmosphere is cosy and you will feel at home. We invite you to eat your meals with us while Bertina is cooking culinary delights in the kitchen. It is in the middle of the small village with about a ten min walk to the river where you have a nice swim or a sunbath on the little beaches.